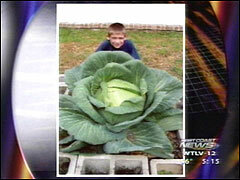 LAKE CITY, FL -- A third grader in Lake City knows how to grow cabbage. And he could be rewarded for his work. Andrew Milito showed off the 15 pound head of cabbage that he grew in his backyard. The cabbage is almost bigger than the nine-year old. He says his classmates were surprised by the size of his class project. Miliato stands to win a $1,000 scholarship if his head of cabbage is the largest in the state. He will find out in September if he'll cash in.